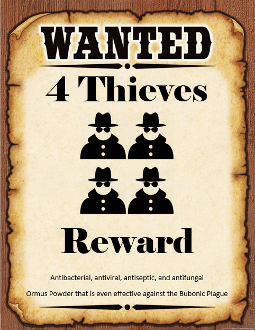 4 Thieves Ormus is made from Clove Buds, Lemon peel, Ceylon Cinnamon, Eucalyptus leaves, and Rosemary. According to legend, four thieves, one of whom was an herbalist, robbed the homes of many who had died of the plague. They were eventually caught and brought to trial. One version of the story recounts that they were sentenced to bury the dead but would be set free if they survived. Another version tells that they were released in return for the recipe for the tonic that they credited with protecting them from the plague. Either way, the thieves survived, as did the legend and the recipe for their herbal vinegar. Though we hopefully won’t ever need this remedy for anything as serious as the plague, it still serves as a valuable remedy against many illnesses and is even a powerful disinfectant and bug spray. The spice contains health benefiting essential oils such as eugenol. It is a phenyl-propanoids class of chemical compound which gives pleasant, sweet aromatic fragrances to the clove-bud. Eugenol has local anesthetic and antiseptic properties, hence; useful in dental care essentials as well as in treatment procedures. The active principles in the clove may increase gut motility as well as improve the digestion power through increasing gastro-intestinal enzyme secretions. Thus, helps relieve indigestion and constipation problems. Lemon peel contains even more vitamins, nutrients, and health benefits than the lemon juice. Lemon peels contain about 5 to 10 times more vitamins than lemon juice. Remember, organic will be your best when consuming the peel to avoid eating any pesticides. Decrease the cholesterol levels in the body which results in maintaining good health of our hearts. This is due to the presence of polyphenol flavonoids. Much of the cinnamon available in the spice aisle of your grocery store isn't cinnamon at all, but cassia. Ceylon cinnamon (cinnamomum verum) is true cinnamon, and it comes from the inner bark of a Sri Lankan evergreen tree. Ceylon cinnamon may have some different health effects than cassia. Both cassia and Ceylon cinnamon have a similar flavor and color, although Ceylon cinnamon tends to be darker in color and sweeter in flavor with a more delicate scent. Cassia comes from the inner bark of an evergreen tree, as well, called Cinnamomum cassia. The tree is native to East Asia. Many people buy cassia instead of Ceylon cinnamon because cassia is much less expensive. Because of this, commercial baked goods typically contain cassia instead of Ceylon cinnamon. Along with these benefits, both types of cinnamon can also help people on low-sugar diets, because it sweetens food naturally without the need for sugar. Because Ceylon cinnamon is sweeter in flavor than cassia, it serves as a wonderful sweetening agent in foods and smoothies that may help you require less sugar to satisfy your sweet tooth. Eucalyptus contains a number of compounds with antispasmodic, anti-harmful organism, expectorant, and decongestant properties. This powerhouse combination of benefits is due in part to a compound called cineole. Cineole is typically cited as the active ingredient in eucalyptus because it is an expectorant, can ease a cough, and fight upper respiratory problems. In addition to familiar vitamins and minerals, rosemary contains other nutritional compounds that are considered to be highly effective antioxidants. These compounds include rosmarinic acid which has anti-inflammatory and antimicrobial action in addition to being an antioxidant. It has also been used in food preservation to improve the shelf life of foods such as fresh seafood. 4 Thieves Ormus is made from Clove Buds, Lemon peel, Ceylon Cinnamon, Eucalyptus leaves, and Rosemary. That is all added to warm harmonically structured lightning water and then blended up. Then I preformed the John Hudson method by adding Organic Dolomite and swinging the PH. Then after washing it 7 times and drying it out, it is now a fine white Ormus powder. Each of these ingredients by themselves are powerful so together they are even more so and it has a pleasant aroma as well.